Shop The City was founded in 2017 by Sahra Schukraft Brandt, a girl who simply loved to shop. 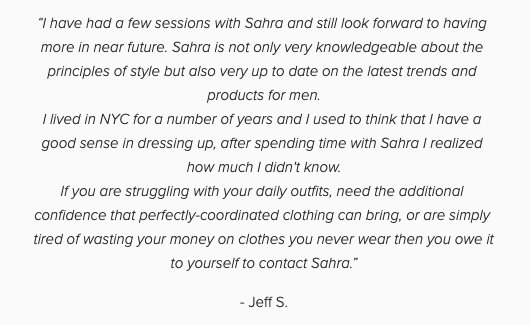 With a degree in Fashion Merchandising from New York City's LIM College and a love of all things style, Sahra wanted a way to bring her background and her love together. Shop The City was created to provide a personal shopping experience to groups where a local stylist brings you to the best places - no scouring Yelp or looking lost necessary! 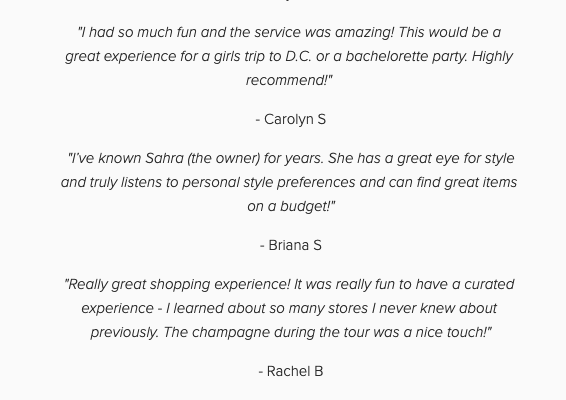 Originally meant for bachelorette parties and girls weekend trips in three major East Coast cities (NYC, DC, and Miami), Sahra found a growing niche of shoppers who wanted to shop local, wherever they were, but not always as a big group. As what happens with any business venture, lessons were learned and pivots were made. 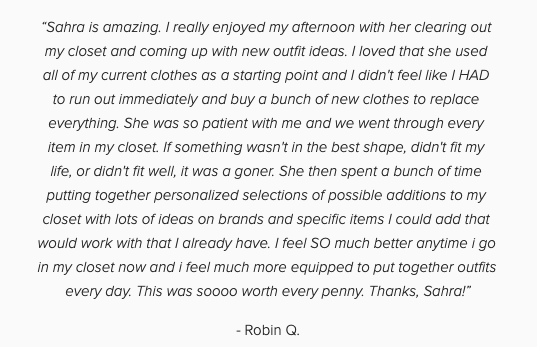 After moving across the country, Sahra found more inspiration to add to her brand, expanding from group tours to wardrobe audits, personal shopping, and remote styling. Today, Shop The City works in SF, LA, and wherever a plane will fly, as well as virtually, to give clients access to style no matter where they are. Scroll down to read more about the team behind Shop The City and to see who you can work with in your city! Sahra has been in the fashion industry for nearly 15 years; at age 11 she began as a model, moving to New York City at 17 to focus on just that. At 19 it was time for college, in which Sahra chose to study fashion merchandising at New York's prestigious LIM College. 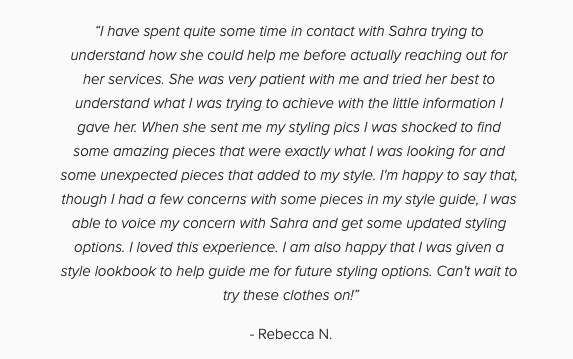 Having interned at numerous fashion houses, showrooms, and with New York Fashion Week experience, Sahra went away with a complete understanding of the fashion industry, trends, and styling. After graduation, Sahra worked as an apparel and accessories buyer for major online retailers and a Washington DC area consignment shop. While working in fashion, Sahra began her own blog, Que Sera Sahra, to chronicle trend and fashion forecasting as well as her own personal style. In 2018, Sahra’s husband’s job brought them bi-coastal, with a charming home in Washington DC and a hip apartment in San Francisco. 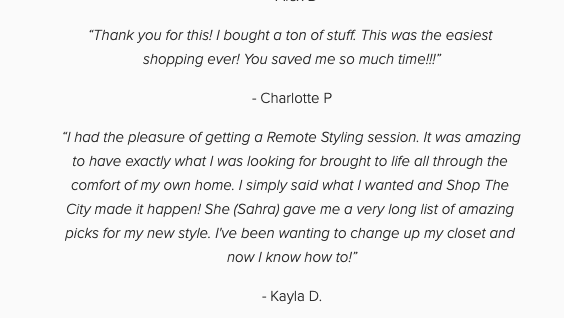 Today, Sahra still runs her blog and is the founder and owner of Shop The City, where she lives her dream of helping people attain their style goals.